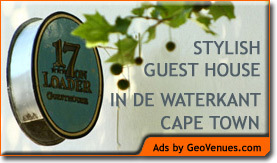 You are here: Home / South Africa / Accommodation in Stellenbosch: Squirrel & Vine Self-Catering Apartment. Accommodation in Stellenbosch: Squirrel & Vine Self-Catering Apartment. A maximum of three guests can be accommodated. The living room is air-conditioned and has a sleeper couch (single bed size), television with selected satellite channels and DVD player. 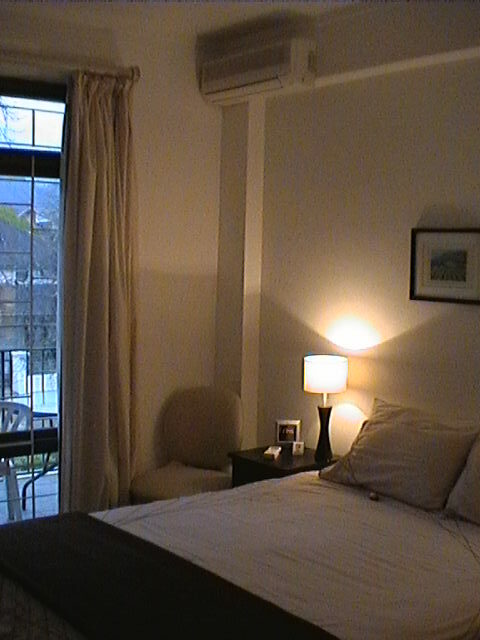 The air-conditioned bedroom features an extra-length queen size bed, radio/alarm, hairdryer and digital electronic safe. The granite kitchen is fully equipped with oven, stove, microwave oven, fridge with freezer compartment, kettle, toaster, coffee perculator, crockery, cutlery and kitchen utensils. A washing machine is also provided. A private covered balcony overlooking Herte Street has a table and chairs for outdoor dining. The bathroom has a bath, shower and twin basins. Secure off-street covered parking is available inside the security complex. Note that open fires are not permitted in this historic part of town – a barbecue and fire place are therefore not available. Squirrel & Vine is serviced according to guests’ preferences, and linen and towels are provided. Please visit our very comprehensive website www.squirrelaccommodation.com for full details, an availability calendar, more photos and to make a reservation. Approximate distances are as follows: 100 meters to Dorp Street, 450 meters to Church Street, 750 meters to Stellenbosch Town Hall, 1.1 kilometers to the University of Stellenbosch (measured to Administration Block A), 1.8 kilometers to Coetzenburg sports grounds (measured to the graduation venue at the DF Malan Centre), 18 kilometers to Somerset West (measured to Somerset Mall), 34 kilometers to Cape Town International Airport. Numerous golf courses and wine estates are situated in the Stellenbosch area. Squirrel & Vine is suitable for guests who travel by car and who wish to stay in the heart of Stellenbosch in a fully equipped, private facility. Comments from past guests most frequently refer to the fact that the apartment is equipped with everything one needs, is in a prime location and is kept very clean. The apartment has a three star grading in the self-catering category from the Tourism Grading Council of South Africa, as well as a three oak leaf grading from the Stellenbosch Tourism and Information Bureau.